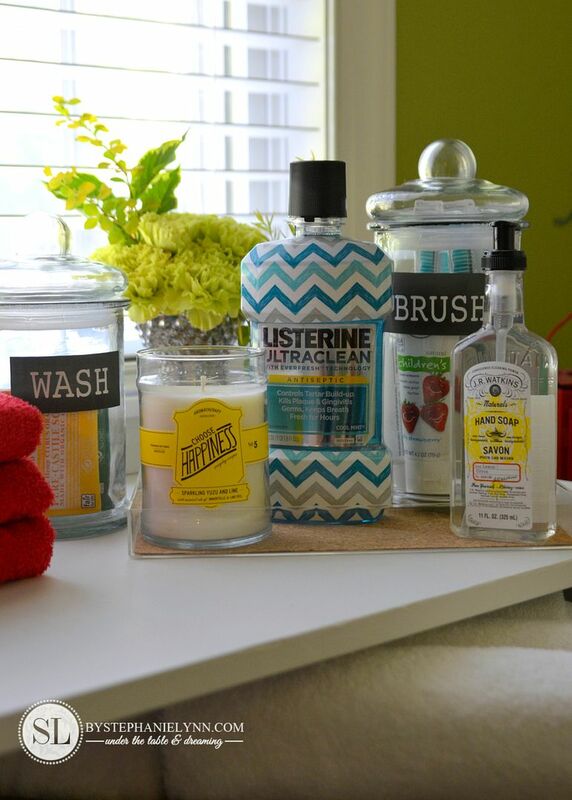 Guest Bath Necessities – bathroom essentials for unexpected guests | This post brought to you by Listerine. All opinions are 100% mine. We have had quite a few overnight guests this summer. For the most part they have been planned visits however there have been a few occasions lately that the guests didn’t even know they were staying until the last minute. We love to entertain and we love company so anyone is always welcome – though I feel a little like I’m slacking in the hostess department when I’m not prepared. 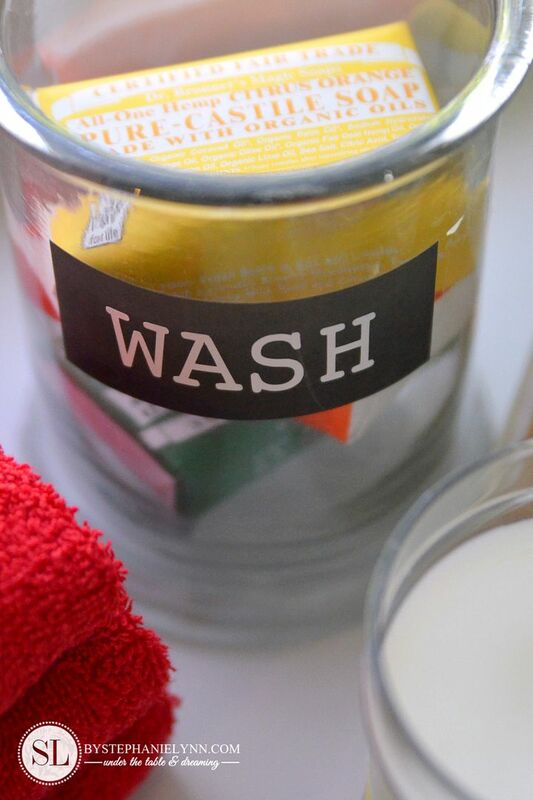 I’ve learned the most important necessities to keep on hand for these unexpected occasions are toiletries. Our little guys bath doubles as our guest bathroom so I made it a point before the summer ends to stock up on some basic essentials. A couple of years ago I transformed a thrift store coffee table into a bench for the room. I’m not normally a ‘stuff on the counter’ kind of girl but the bench was the perfect spot to corral the bath necessities. I began by making a simple tray from a clear acrylic picture frame I picked up at the craft store. The 9 X 12 boxed frame works perfectly as a small tray when turned upside down. I lined the inside of the frame with a piece of scrapbook paper – which was made from cork. 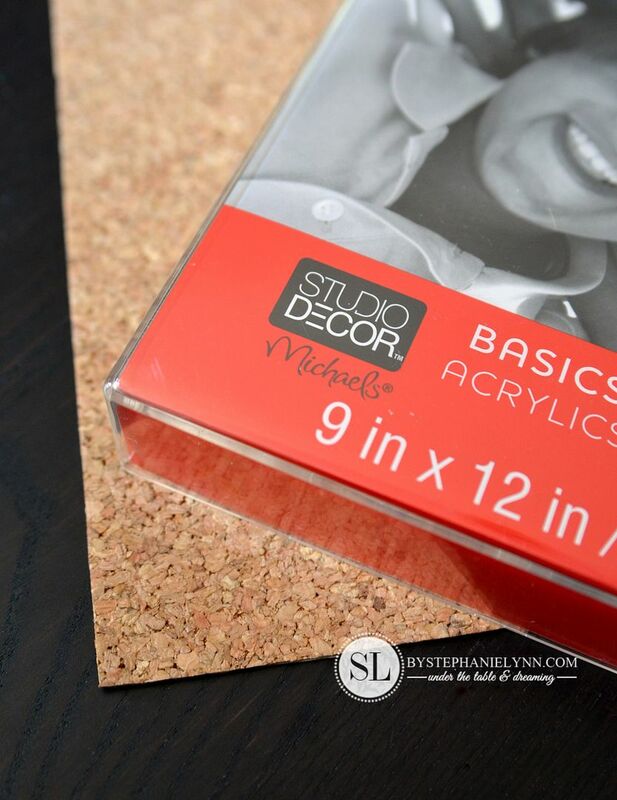 The cork sheet wasn’t glued – just trimmed and set inside the frame – which makes it easier to clean or even replace. At the top of my list were extra toothbrushes, toothpaste, and a spare bottle of mouthwash. 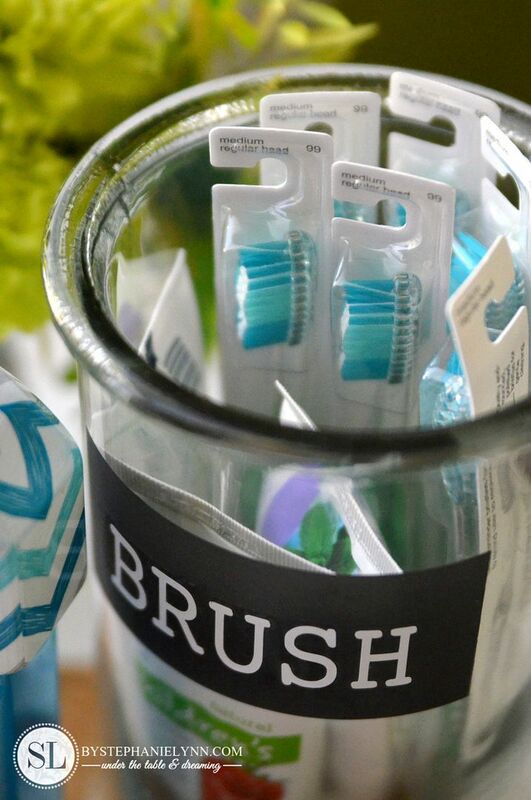 Since these aren’t for everyday use, the brushes and paste were tucked in a canister. 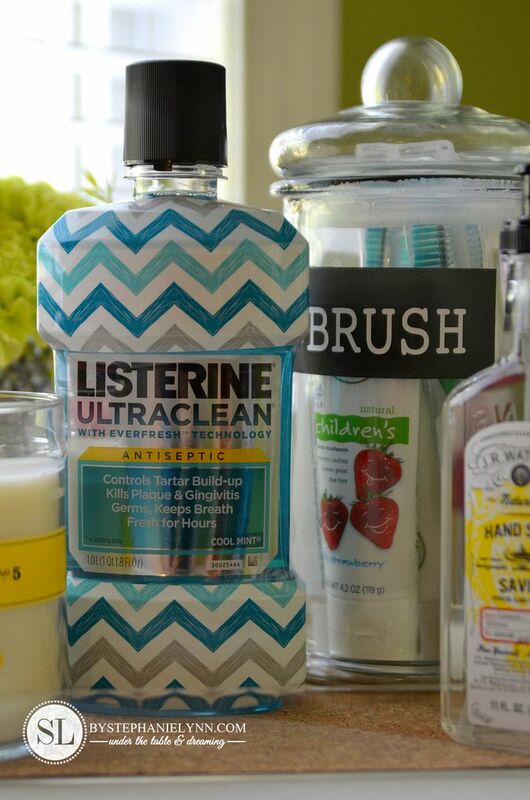 The new limited edition chevron bottles of Listerine are perfect for keeping out on display. The bright colorful patterns are available exclusively at Target and add some fun trendsetting design to your daily routines. 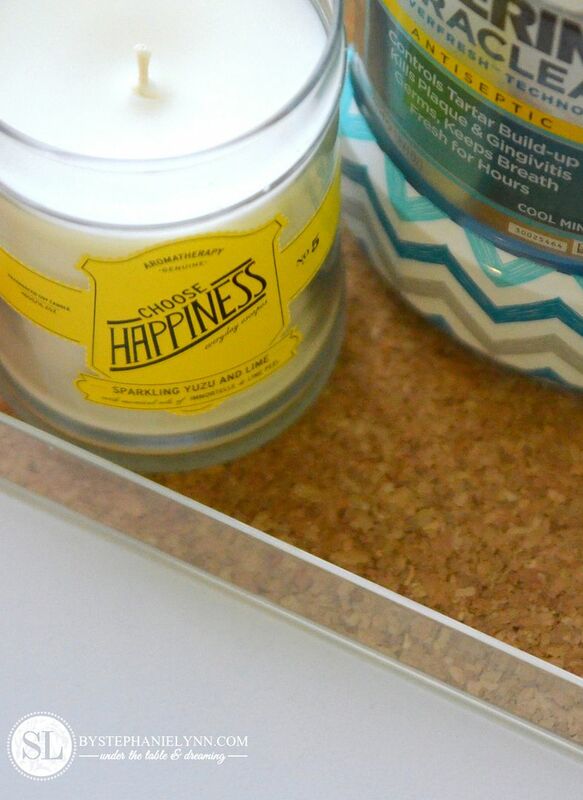 I also picked up this cheerful candle at Target as well. 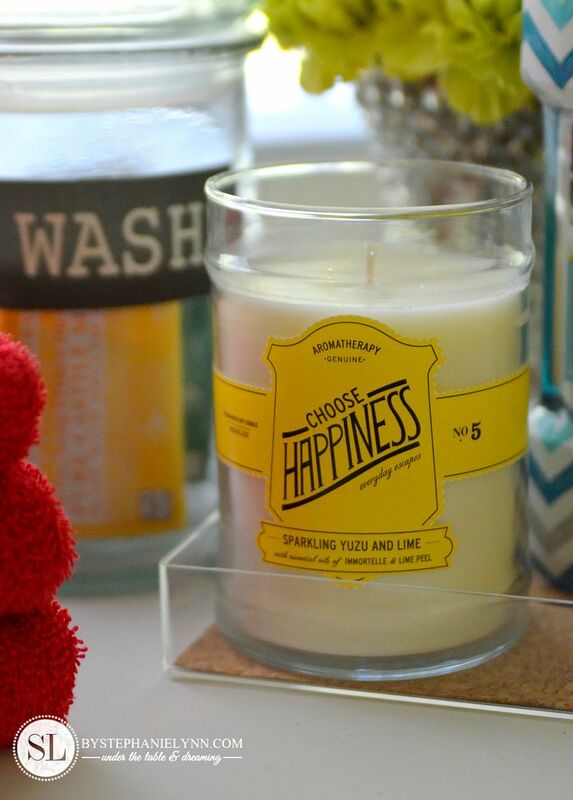 The candle is definitely not an necessity but I love the little daily reminder printed on the front – plus it smell pretty amazing without even being lit. Another special touch – fresh flowers. 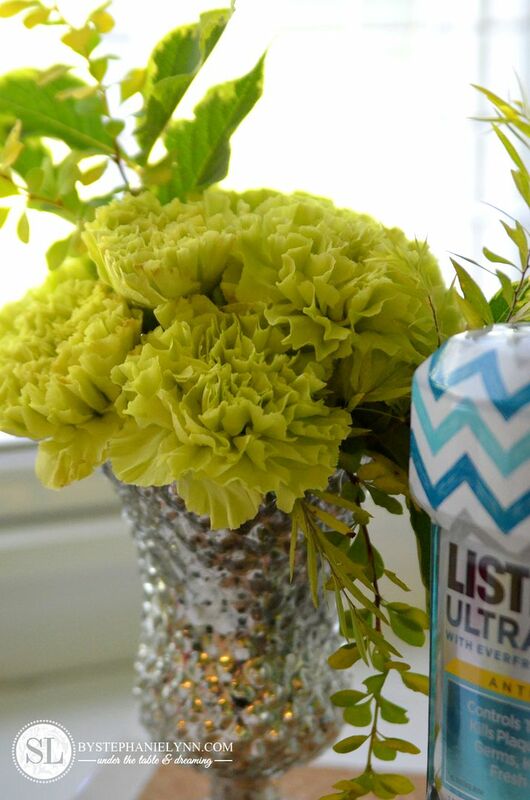 These are not only for the guests but a great addition to brighten up each morning. I typically just pick up an inexpensive bouquet each week and dress it up with cuttings from the yard. 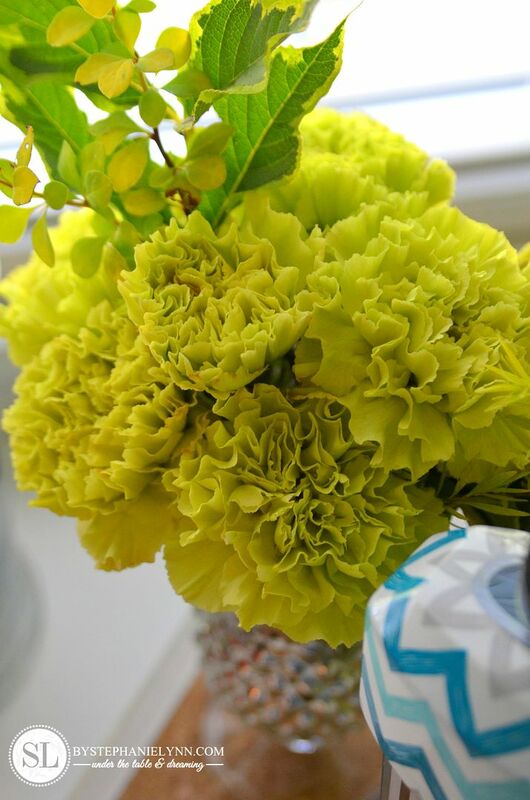 I can generally get two small arrangements from one bouquet – perfect for the power room and bath. Extra soap, towels, and washcloths were the last thing on my list. I’ve found having a separate set of towels reserved just for guests means they are always clean, folded and ready to go. Are there any extras you stock up on for those unexpected occasions? 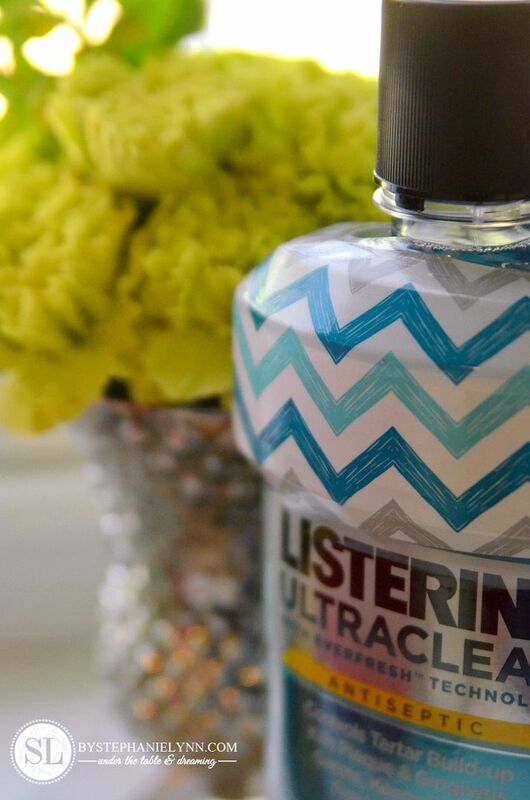 Listerine is the number one dentist recommended brand that gives you a cleaner, healthier mouth. The special designer bottles are available in four refreshing flavors: cool mint, artic mint, fresh citrus, and fresh mint (our personal favorite). Pick them up now, for a limited time, at Target and don’t forget to Save Now with Target Cartwheel for an additional offer! I love how you turned the frame upside down to use as a tray! Brilliant!